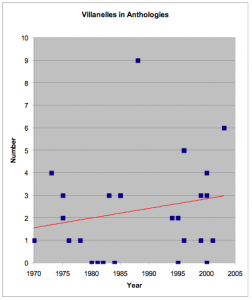 ¶ 1 Leave a comment on paragraph 1 0 On this chart, the villanelles in the anthologies I examined (listed below) are plotted by number and year. Blue squares are data points, and the red line shows an increasing average since 1970. Arthur Thomas Quiller-Couch, ed., The Oxford Book of English Verse, 1250-1918, New edn. (New York: Oxford University Press, 1940). 0 None. D. J. Enright, ed., The Oxford Book of Contemporary Verse, 1945-1980 (Oxford; New York: Oxford University Press, 1980). 0 None. Martin Booth, ed., Contemporary British and North American Verse: An Introductory Anthology (Oxford; New York: Oxford University Press, 1981). 0 None. Donald Merriam Allen and George F. Butterick, eds., The Postmoderns: The New American Poetry Revised, 1st Evergreen edn. (New York: Grove Press, 1982). 0 None. Robert Penn Warren and Academy of American Poets., eds., Fifty Years of American Poetry: Anniversary Volume for the Academy of American Poets (New York: H.N. Abrams, 1984). 0 None. Jay Parini, ed., The Columbia Anthology of American Poetry (New York: Columbia University Press, 1995). 0 None. Michael Collier and Bread Loaf Writers’ Conference of Middlebury College, eds., The New American Poets: A Bread Loaf Anthology (Hanover, NH; London: University Press of New England, 2000). 0 None.